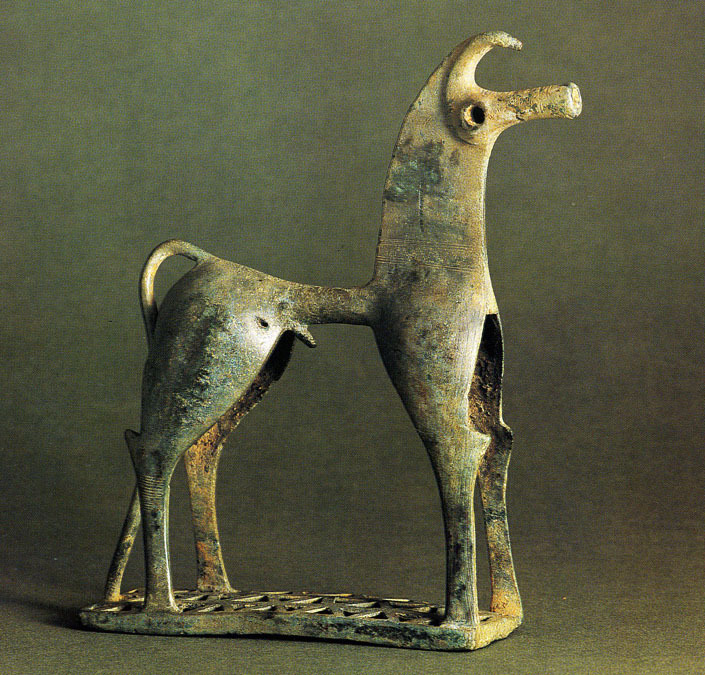 Bronze Horse, c. 750 BCE, Greek Geometric Period. 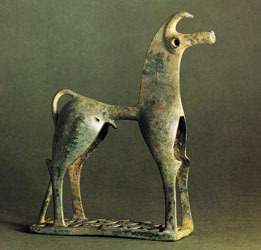 Statuettes of horses like this were one of the most popular subjects of Geometric period at the beginning of the historical period of Greek culture. Along with the invention of writing, this period of the middle of the eighth century witnessed the rise of the distinctive Greek political unit, the polis or city-state. The popularity of the horse as a symbol during the Geometric period can be explained in two ways. It was clearly a symbol of higher social status. Only the wealthy could afford a horse. 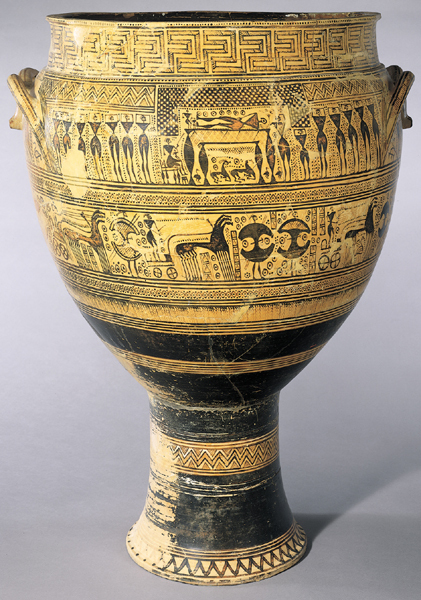 The Dipylon vases that served as funerary monuments for aristocrats from the Geometric period frequently show multi-horsed chariots along with warriors. The horse was also a symbol in early Greek culture of the human ability to domesticate animals and thus gain control over animal power. The artist's abstract approach like a modern sculptor finds the geometric order under the natural form. These small figurines thus articulate themes that will endure to the present day. Even today owning and riding a horse is a sign of wealth and status. Thoroughbred racing is frequently called the "Sport of Kings." "Taming" and "Harnessing" natural forces are still metaphors in use today. 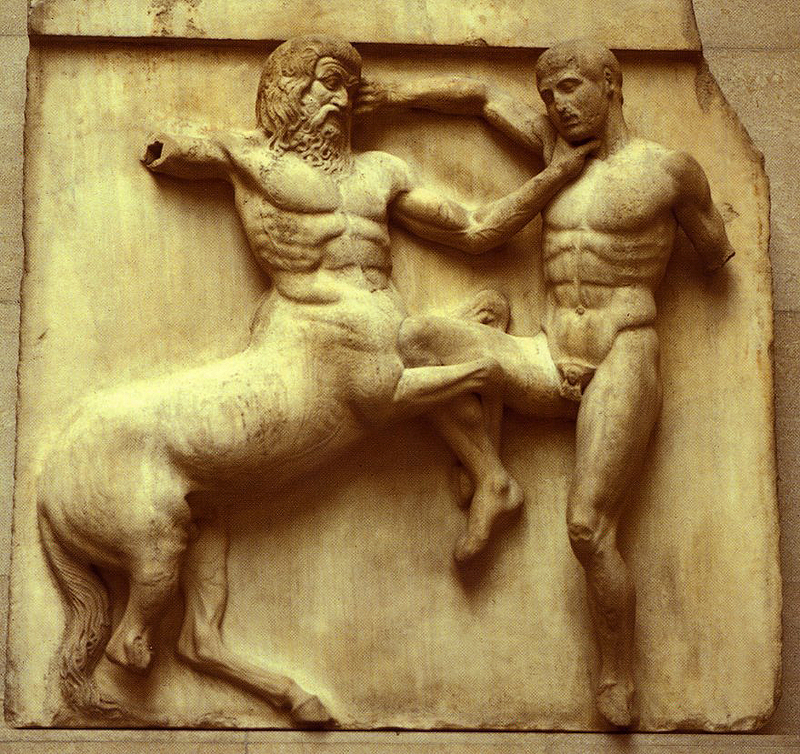 Metope of the Battle of a Lapith and Centaur from the Parthenon, 447-432 B.C.E. One of the most popular stories in early Greek art is the conflict between the Lapiths and the half-human, half-horse creatures from Thessaly. Attending the wedding of the Lapith king, the Centaurs became drunk and attempted to abduct the bride. 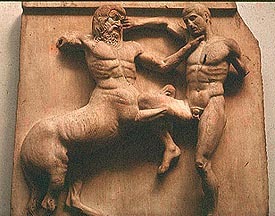 The Lapiths drove the Centaurs from Thessaly. Both their half-horse nature and their drunkenness make the Centaurs chaotic and the antithesis of the Lapiths the representatives of cosmos or order. The story thus embodies the archetypal binaries of Greek culture: cosmos/chaos, human/animal, rational/irrational, culture/nature, etc. Detail from the Panathenaic Frieze from the Parthenon, 447-432 BCE. This famous continuous frieze begins at the west end of the temple with scenes of Athenian citizens preparing to mount their horses at the outset of the procession. These figures are followed by riders and charioteers. 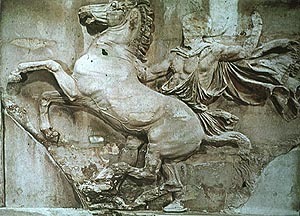 The prominence of horses in the Parthenon frieze continues the theme of the horse evident in Greek art since the Geometric period. 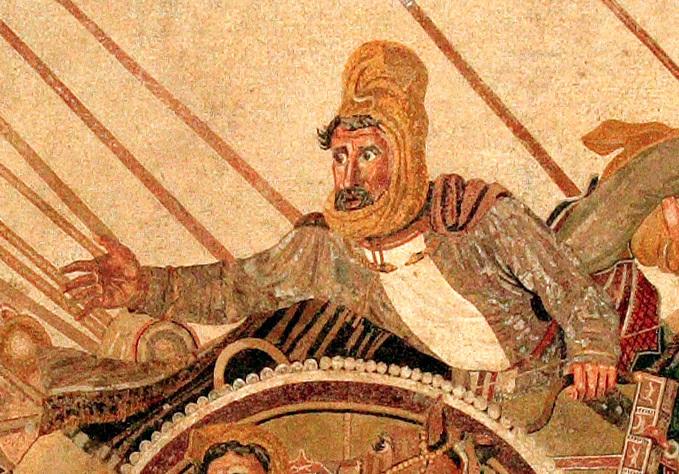 In this particular detail, an Athenian is shown bringing a horse who has run amok under control. The wild expression, rearing pose, and even bulging veins on its belly make this horse a symbol of chaotic nature that needs to be brought into order. This echoes the theme of the Lapiths and Centaurs from the metopes. A floor mosaic found in the remains of a Roman house in Pompeii is likely a copy of a panel painting painted by Philoxenos of Eretria about 310 BCE. 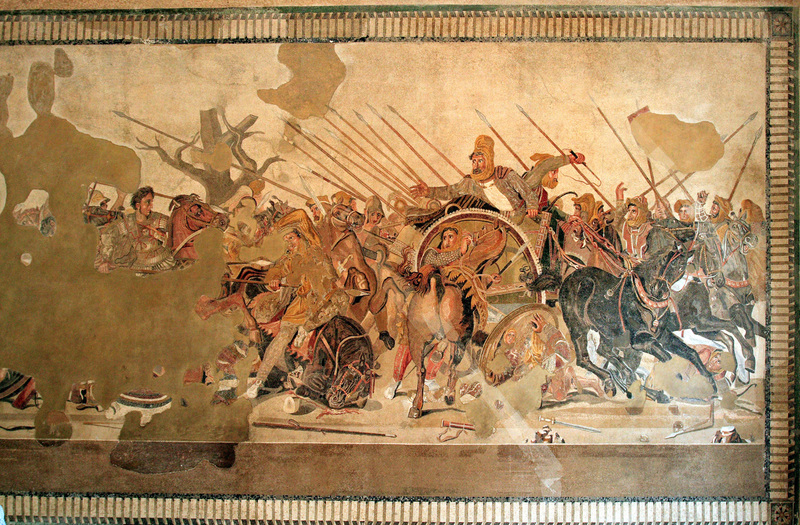 The mosaic represents the pivotal moment in the Battle of Issus when the Persian king Darius retreats from the rel entless attack of the Greeks led by Alexander on horseback. The narrative focuses on the contrast between the heroic Alexander personally leading the attack and the terrified Dariusattempting to flee. 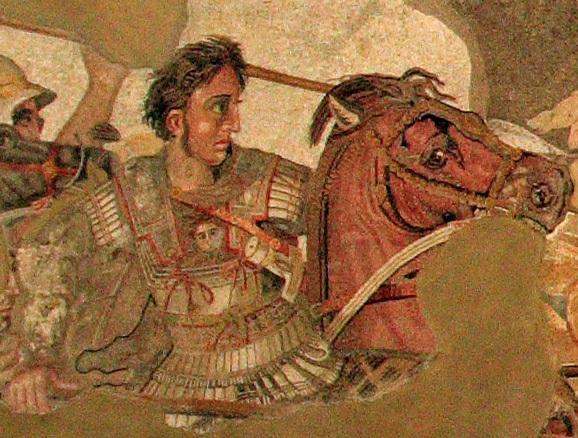 Alexander was known to have had a horse named Bucephalus who was so wild only Alexander could tame and ride him. 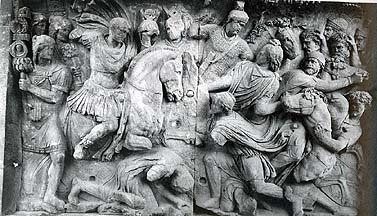 Trajan on Horseback from the so-called Great Trajanic Frieze probably from the early years of the reign of Hadrian. This relief was a part of a larger frieze that probably originally decorated the Temple of the Divine Trajan constructed by Hadrian at the end of the Forum of Trajan. This portion of the frieze was incorporated into the Arch of Constantine. 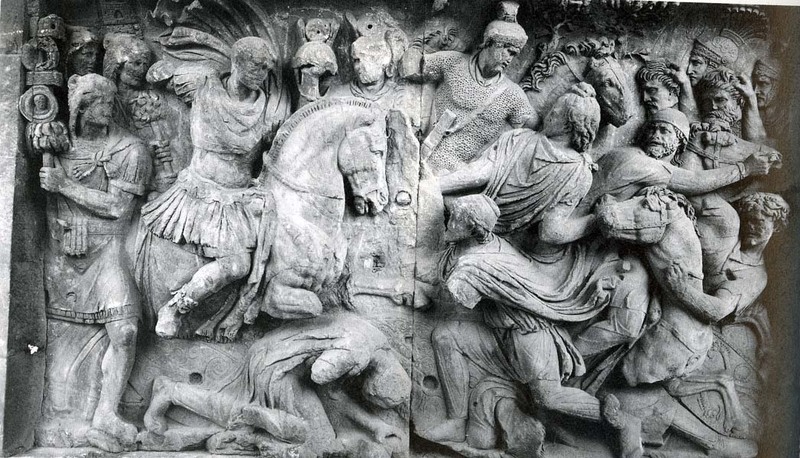 This detail shows Trajan on horseback leading a charge. It commemorates Trajan's campaigns in Dacia. A Dacian appealing for clemency kneels at the feet of Trajan's horse. Less than showing a particular event, the intention of the relief is to glorify the heroic nature of the Imperator Trajan and his clemency. He is thus constructed as a strong but just Emperor spreading civilization to the barbarians. 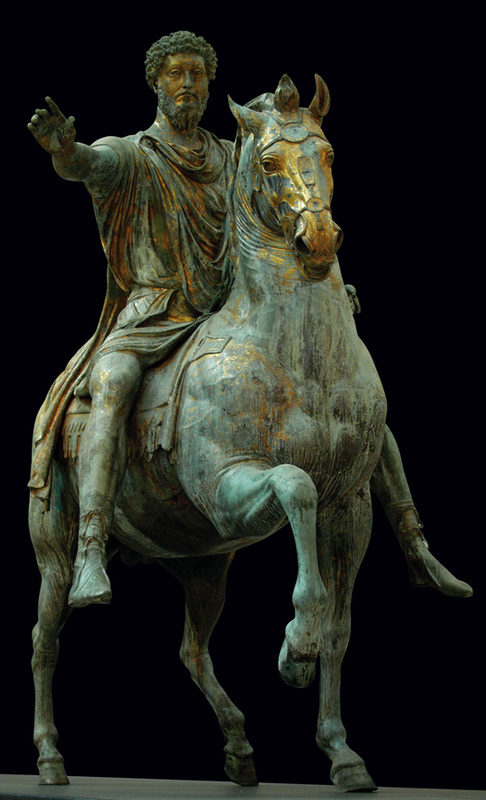 The Equestrian Statue of Marcus Aurelius, 176. This is the only fully preserved Roman imperial example of an equestrian statue. Literary references make it clear that this formula for representing emperors and great generals was widely popular throughout the Roman world. The survival of this statue is due to the mis-identification of it during the Middle Ages as a statue of the Emperor Constantine. 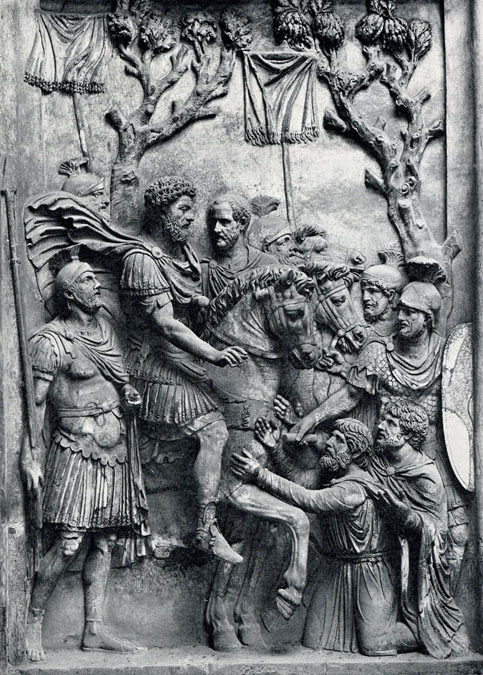 Rather than wearing the cuirass of the Imperator, Marcus Aurelius is shown wearing a short tunic and patrician boots indicating his civil rather than military functions. Originally the horse's raised right leg rested on a now lost fallen barbarian. The message is clear that just as Marcus Aurelius has mastered the horse he and Roman authority will subdue the barbarians. 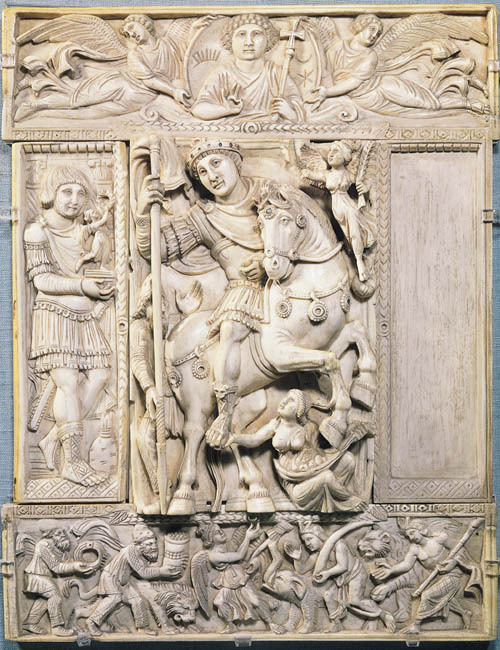 Barberini Ivory: the Equestrian image of the Emperor Justinian, mid-sixth century. 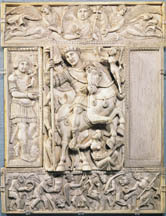 Based on conventions derived from Roman Imperial art, this ivory represents the Emperor Justinian as an equestrian figure. A Nike figure crowns Justinian, while a terra or tellus figure lies beneath the front legs of the horse and supports the foot of Justinian. To the left behind the horse appears a barbarian identifiable by long pants and cap looks up in astonishment at Justinian. In the left panel appears a general wearing a cuirass and offering a Nike figure to Justinian. The bottom panel shows other barbarians offering the bounty of their lands as tribute to a central Nike figure who looks up to Justinian. The upper panel shows a youthful, Apollo-like figure of Christ in a medallion with symbols of the sun, moon, and stars, being borne by two angels. The relationship of this panel to the central panel of Justinian demonstrates the source of Justinian's power. The choice of the beardless Christ was perhaps made to draw the likeness to the beardless image of the emperor. Except for the panel with the image of Christ this panel is understandable in terms of the conventions of Roman Imperial art. 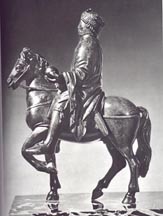 Equestrian Portrait of a Carolingian King, early nineth century. 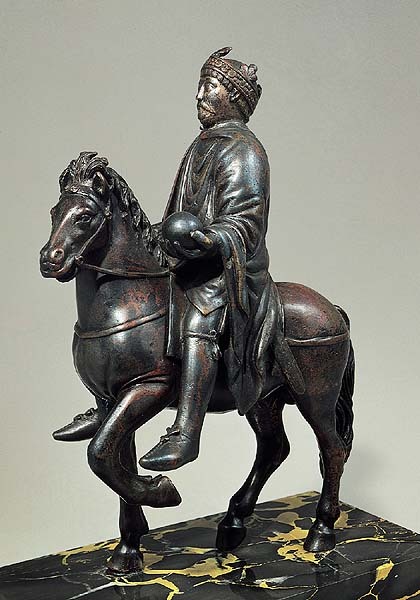 This small scale bronze possibly representing Charlemagne clearly revives of the formula of equestrian statue from Roman Imperial art. We know that Charlemagne brought back from Ravenna a statue of the Ostrogothic king Theodoric which Charlemagne thought to be a portrait of the Empeor Constantine. The statue was placed in his palace complex in his capital Aachen. 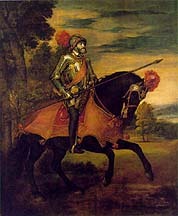 Titian, The Emperor Charles V on Horseback, 1548. 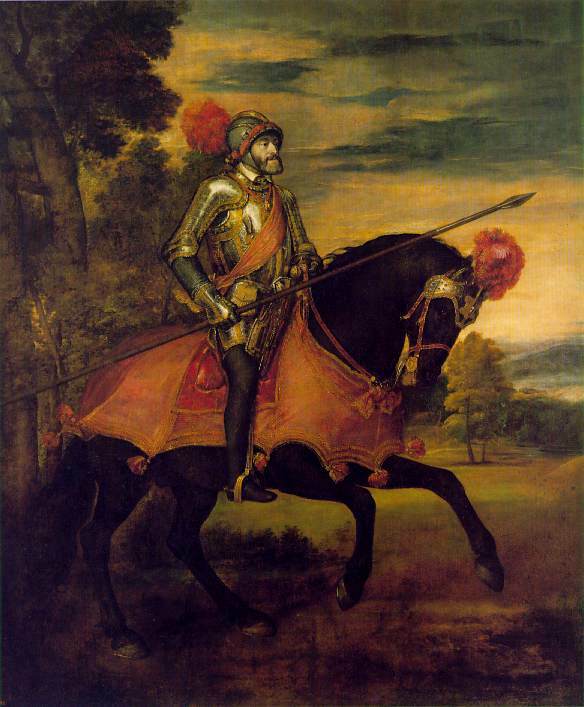 Painted in Augsburg, this great equestrian portrait represents the Emperor Charles V wearing the armor he had worn during his victory over the Protestant Princes at Mühlberg in 1547. Bernini, The Vision of Constantine, completed in 1670. 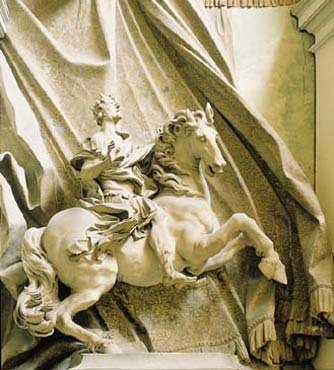 As part of the Scala Regia in the Vatican, Bernini represented the famous vision of Constantine before the Battle of the Milvian Bridge when he saw in the heaven a cross and the message In hoc signo vinces (By this sign conquer). 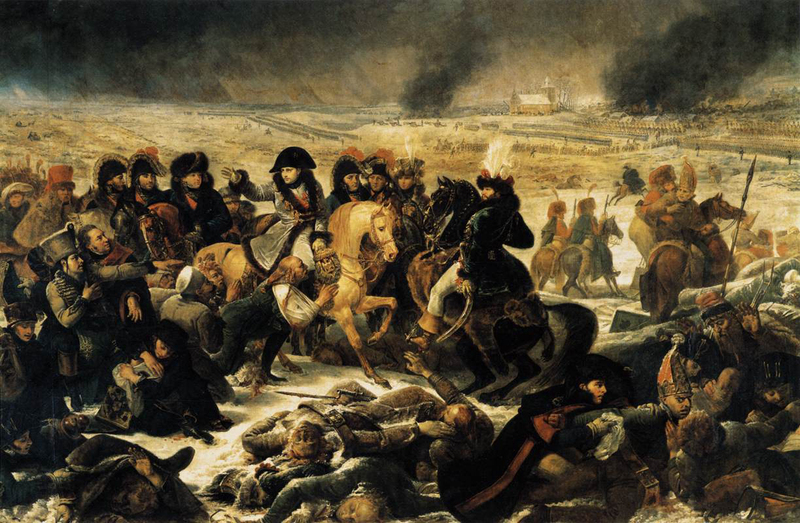 Jacques Louis David, Napoleon Crossing the St. Bernard Pass, 1800. David's career was inextricably connected to the political world of France. 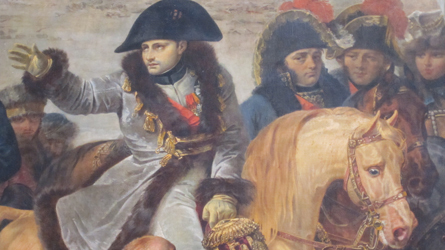 When Napoleon came to power, David through his paintings helped create a public identity for Napoleon. 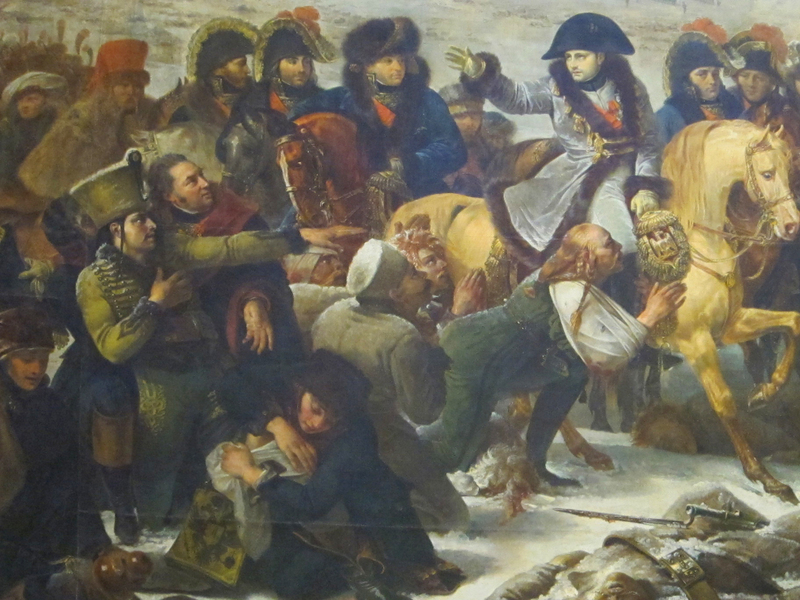 This work is in response to the great military feat that Napoleon accomplished on May 20, 1800 when he led his army across the perilous Alpine pass at the Grand-St.-Bernard. Employing the tradition of the equestrian portrait, David treats the work less as a document and more as a political fiction. The calm Napoleon easily masters the wild rearing horse. 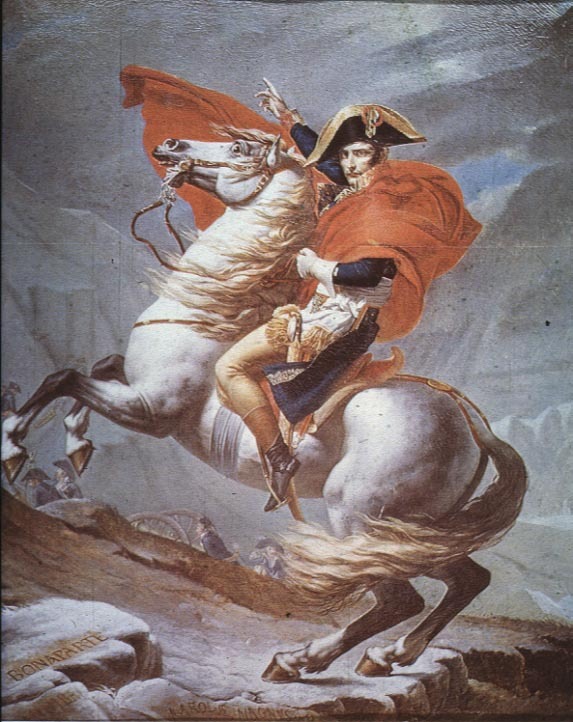 The juxtaposition of Napoleon's calm but determined expression with the ferocity of the horse's expression clearly echoes a theme traced back to Greek art. David treats Napoleon as a superman as he towers over his ant-like army in the background. David makes clear the historical precedents for Napoleon's accomplishment by including Napoleon's name along with those of Hannibal and Charlemagne inscribed on the rocks in the foreground. 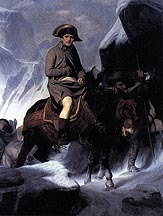 Paul Delaroche, Napoleon Crossing the Alps, 1848. 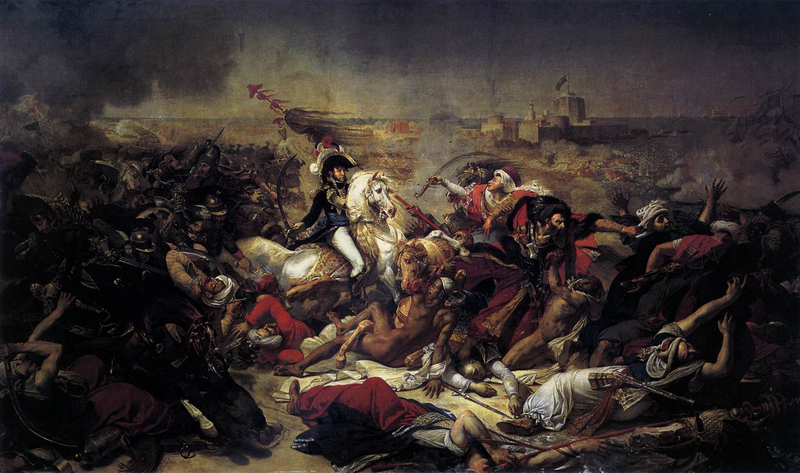 Baron Antoine Gros, Murat at the Battle of Aboukir, 1806, 18'11 1/2"X 31'9". Baron Antoine Gros (1771-1835) was a student of David. 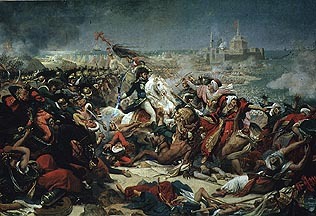 Like his teacher, Gros dedicated his art to producing images that recorded and glorified the military campaigns of Napoleon. These monumental history paintings are in an artistic tradition that can be traced back to Roman Imperial sculpture like the Great Trajanic Frieze and the Alexander Mosaic, both discussed above. Gros depicts the pivotal moment in the French victory over the Turkish army at the Battle of Aboukir that took place on July 25,1799. The battle was decided at noon by a cavalry charge led by General Joachim Murat that retook a key fort and captured the Turkish leader Mustapha Pasha. 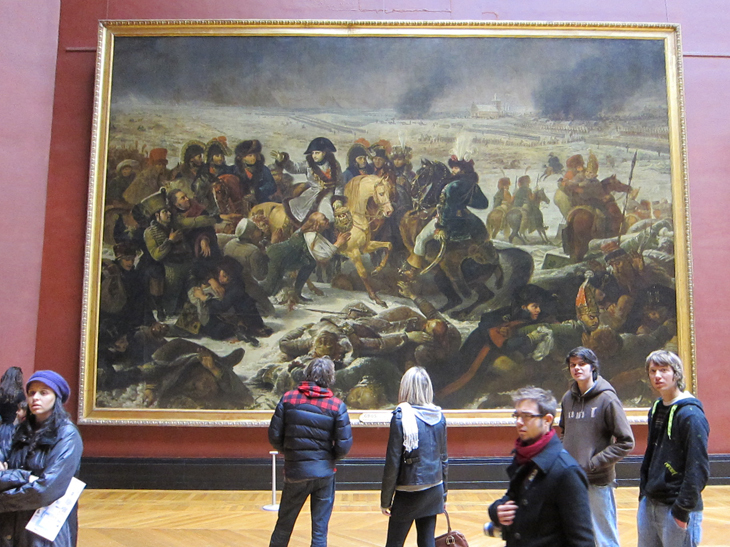 Gros centers his painting around the figure of Murat leading the charge against the Turkish army. 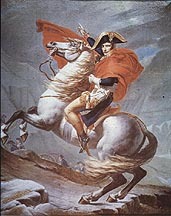 Like David's equestrian image of Napoleon, Gros constrasts the wild power of the horse with the calm and controlled figure of Murat. 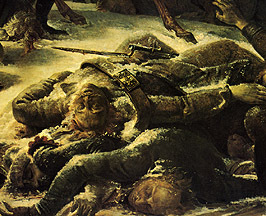 The figure of Murat is also in stark contrast to the chaos around him. 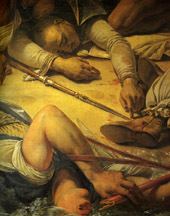 The painting with its brutal violence would be senseless without the figure of Murat at its center. Baron Antoine Jean Gros, Napoleon at Eylau, 1808, 17' 5 3/4" X 26' 3". 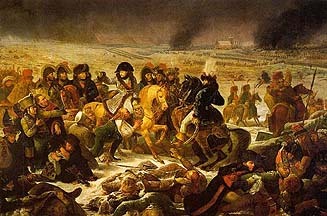 Five weeks after the bloody encounter with the Russians at Eylau (25,000 dead), a competition was announced for a painting designed to commemorate the Napoleonic victory. Denon, the director of French Museums, dictated the program for the entries: "The moment is that when His Majesty visiting the battlefield at Eylau in order to distribute aid to the wounded, a young Lithuanian hussar, whose knee had been shot off, rose up and said to the Emperor: 'Caesar, you want me to live....Well, let them cure me and I will serve you as faithfully as I did Alexander!.'" Gros' painting echoes Roman reliefs showing the Clemency of the Emperor like the relief of Marcus Aurelius. 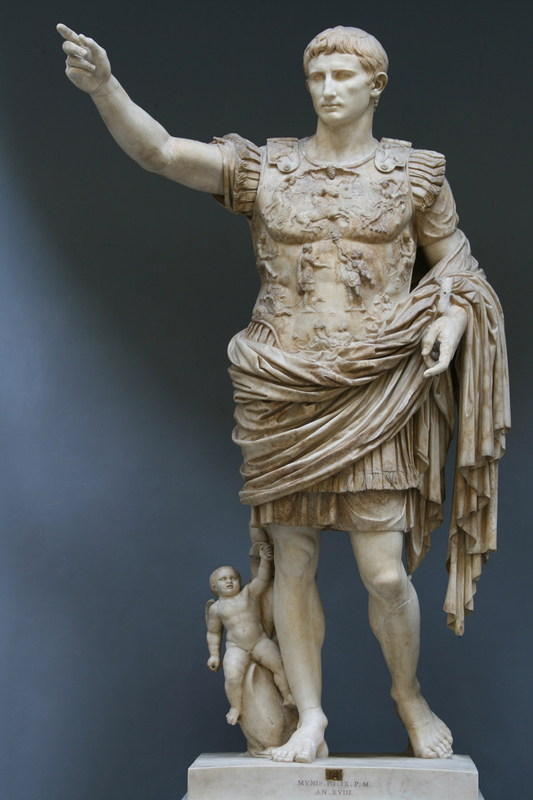 Napoleon's commanding gesture owes its ultimate source to the ad locutio gesture made famous in Roman imperial works like the Augustus of Primaporta. 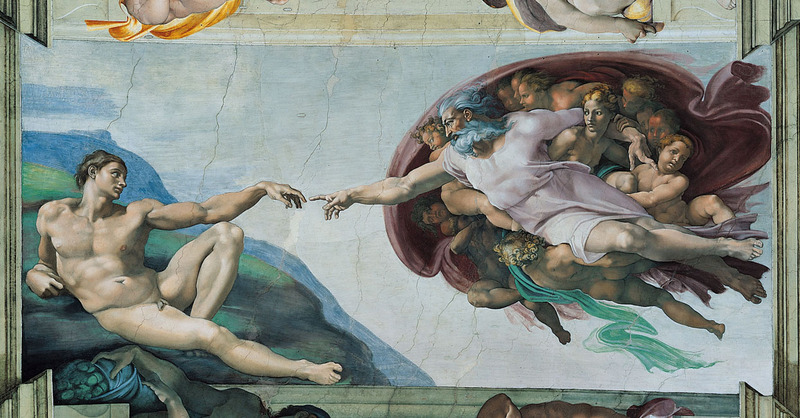 At the same time Napoleon's arm together with the appealing outstretched arm of the Liuthuanian hussar call to mind Michelangelo's Creation of Adam. It is only Napoleon who gives meaning to the otherwise senseless carnage piled up in the foreground of the work. 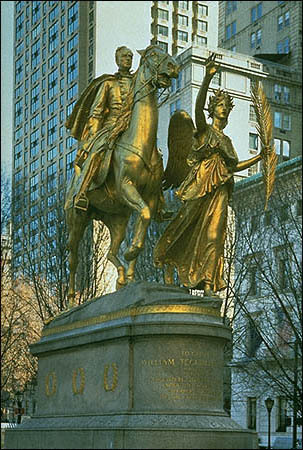 Augustus Saint-Gaudens (1848-1907), General Sherman Monument, unveiled 1903, Fifth Avenue and 59th Street, New York. This bronze monument to the Union Civil War General William Tecumseh Sherman is clearly grounded in the western classical tradition. Significantly its first public display was at the Paris Universal Exposition of 1900. It was awarded the Grand Prix. 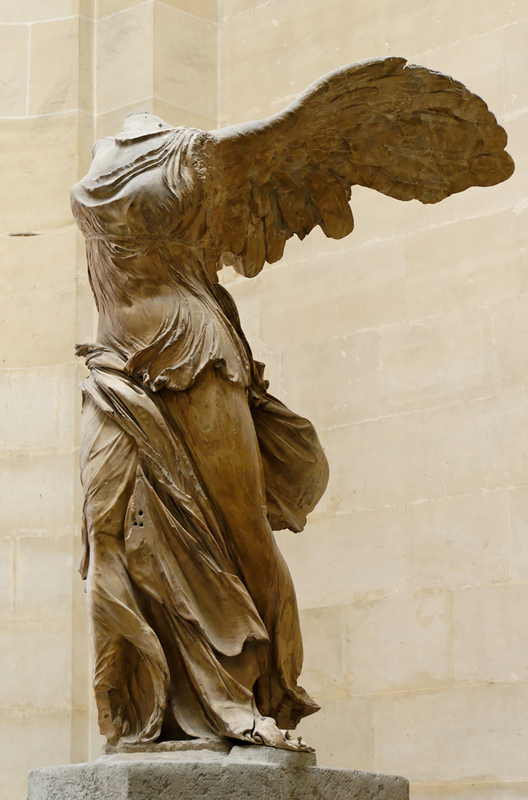 The equestrian image of Sherman, clearly in the lineage of the Roman Marcus Aurelius statue, is led by the female personification of Victory whose conception echoes works like the Greek Hellenistic work, the Nike of Samothrace. 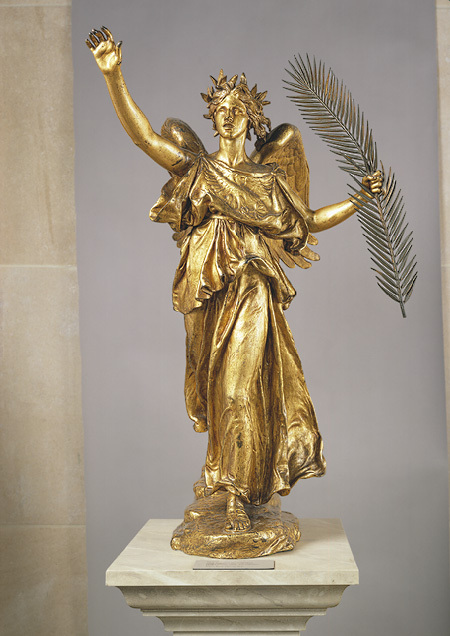 Saint-Gaudens was the most famous American sculptor of the end of the nineteenth-century. Born in Ireland, Saint-Gaudens grew up in America. He returned to Europe to recieve his artistic training at the École des Beaux-Arts in Paris and later visited Rome. His work and its popularity in America reflects the strong European heritage of American culture. Metropolitan Museum of Art bronze gilt figure of Victory from the Sherman Monument. 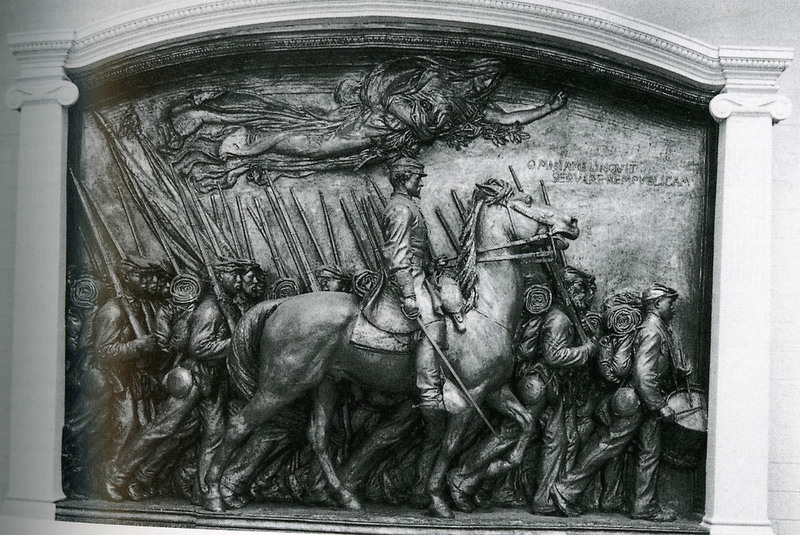 Augustus Saint-Gaudens, Memorial to Robert Gould Shaw and the 54th Regiment, 1897. This memorial on the Boston Common celebrates Colonel Shaw and the first all-black, volunteer regiment, 54th Massachusetts. Shaw and half the regiment died in 1863 attempting to take Fort Wagner near Charleston, North Carolina. While the monument was sponsored by abolitionist whites who wanted to memorialize the sacrifices of black soldiers during the Civil War, the monument in its final form still maintains racial stereotypes. Shaw, the white colonel from a patrician family, is set apart riding on his horse. 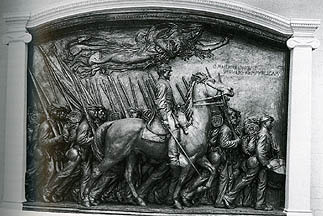 The black soldiers are placed on the level of the horse. The legs of the horse are hard to distinguish from those of the marching soldiers. Both horse and black soldiers dutifully obey the commands of Shaw. Originally only Shaw is identified by name on the monument. It was not until 1982 that the names of the black soldiers were recorded on the monument. See the discussion of the Shaw memorial at the National Gallery of Art web site. 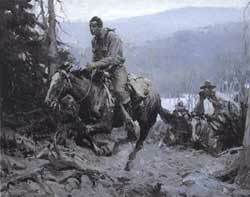 Born in Canton, New York in 1861, Frederic Remington through his paintings. illustrations, and sculptures played a major role in constructing the myth of the American Cowboy. Remington's work, which became popular at the close of the 19th century just at the point of the closing of the frontier and the end of the Old West, is permeated by a nostalgia for a lost era. 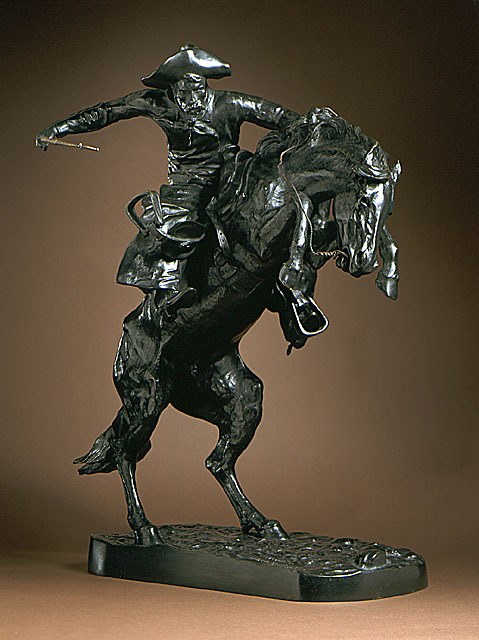 Along with the Wild West shows of Buffalo Bill and a President, Theodore Roosevelt, Remington's art captivated the American imagination with the idea of the cowboy. The cowboy embodied a spirit of adventure and personal qualities of independence, individualism, self-confidence, and stoic heroism. The anti-intellectualism and sense of moral rectitude of the cowboy has been regularly seen as a foil to the cultivated intellectual steeped in European culture. The cowboy is understood as a product of nature as opposed to culture. Comparably Remington's art with its sense of wildness and lack of refinement stands in stark contrast to the classicism steeped in the European tradition evident in the works of Saint-Gaudens discussed above. 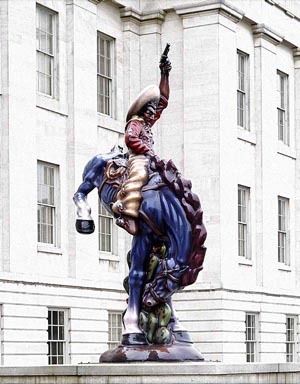 The optimistic vision of the cowboy taming the Wild West has captured the national imagination from the time of Remington, through the Westerns of popular culture and the marketing symbols like the "Marlboro Man," to the public identities of American Presidents like Ronald Reagan and George W. Bush. Consider the morphing of the Western into a Middle Eastern in the 2004 movie Hidalgo. The themes of this movie echo our current foreign policy. 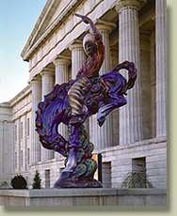 Luis Jimenez, Vaquero, modeled 1980/cast 1990; acrylic urethane, fiberglass, steel armature, 199 x 114 x 67 in. Smithsonian American Art Museum. See Director's Choice. 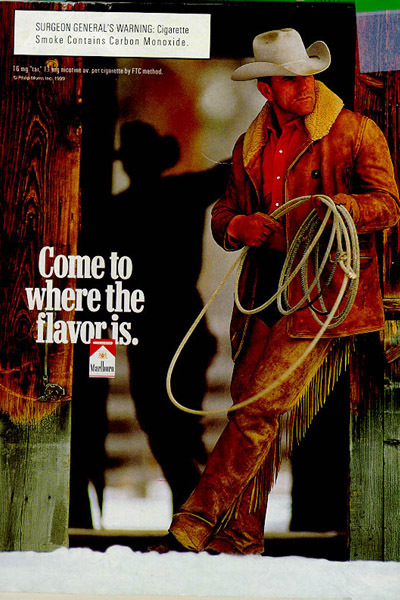 Robert S. McElvaine,The Making of the Marlboro Man, 2004: argues that George W. Bush is the 2004 Marlboro Man. 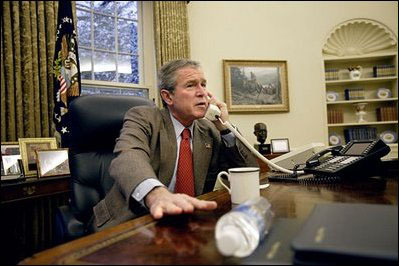 Caption from Yahoo accompanying the picture above: "President George W. Bush, speaking from the Roosevelt Room of the White House, announces he will endorse a constitutional amendment that would ban gay marriage, February 24, 2004." 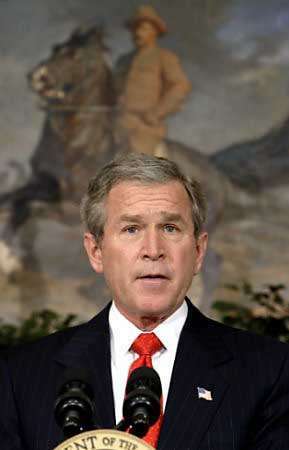 Behind Bush's head appears a painting of Teddy Roosevelt as a Rough Rider. For reasons why T.R. would be an important model for George W. Bush see the article by Harvey Mansfield entitled "The Manliness of Theodore Roosevelt. "In a White House that leaves little to chance, consider the reasons for having the President make this speech in this context with this painting staged strategically behind Bush's head. ---Excerpt from President Bush's speech: "After more than two centuries of American jurisprudence, and millennia of human experience, a few judges and local authorities are presuming to change the most fundamental institution of civilization. Their actions have created confusion on an issue that requires clarity." President Bush in the Oval Office with the painting by W.H.D. Koerner entitled A Charge to Keep on the wall behind him. The then-Governor identifies himself and his staff with this horseman: "This is us. What adds complete life to the painting for me is the message of Charles Wesley that we serve One greater than ourselves."